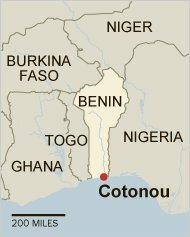 COTONOU, Benin - This is not about secretive mutterings in the dead of night or freakish eccentrics, explained Dah Aligbonon Akpochihala, an eminent voodoo priest who has taken to the airwaves to preach the old messages of faith, fidelity and obedience integral to his religion. It is about bringing a younger generation on board. Despite the stigma, Voodoo has a wide following in Benin. "Voodoo is sabotaged, demonized, as if there was nothing good in it,"� Mr. Aligbonon said in his austere office - a bare, whitewashed room, with a cracked linoleum floor and disused fan. A slight, mild-mannered aristocrat in a blue robe, Mr. Aligbonon maintains his modest cinder-block temple on a busy commercial street in this bustling commercial capital, one of the continent's major ports. The temple sits between a beauty parlor and a hardware stall, and offers spiritual consultation and ceremonies to Mami Wata (a water divinity) - along with photocopying, binding services and CDs in the Fon language of Mr. Aligbonon's broadcasts. Chickens peck in the courtyard - they have multiple uses, food and sacrifice - laundry hangs on the rack and a baby bawls from within. This mundanity is testimony enough to the integration of voodoo, or vodoun, into daily life in Benin, the country that claims to have given birth to the religion. Underneath the Christian and Muslim surface, the old-time faith persists for many here, experts on voodoo say. Nocturnal visits to féticheurs, or priests, after having attended, say, Catholic Mass or prayers at the mosque are hardly uncommon, says Félix Iroko of the Université d'Abomey-Calavi, a historian and one of the country's esteemed academics - though he would never talk about such a thing in public, he says with a laugh. Mr. Aligbonon takes it a step further. He regularly speaks on radio and television in Benin, a priest with a will to electronically diffuse the wisdom of ancestors from centuries past. The aim, in his telling, is to bring voodoo and associated teachings out of the closet and up to date, just like with the rapid-fire training he is developing to create initiates in three months, instead of the usual three years. Even though voodoo is widely followed in Benin - "The double practice persists, even among university people,"� says Mr. Iroko - an unjustified stigma still comes with it, Mr. Aligbonon says indignantly. "Voodoo is not the devil, and still less Satan,"� he writes emphatically in one of the pamphlets for sale in his storefront, a detailed guide to the religion's principal divinities. On the contrary, he says, voodoo is "based on natural law"� and existed before Buddha, Christ and Muhammad. Fragments of this philosophy - "If you respect nature, nature will protect you,"� but "if I do evil against someone, that diminishes my force"� - are dispensed fluently in conversation. Mr. Aligbonon is equally happy talking about his prowess on the airwaves. "When Aligbonon comes on the radio, nobody sleeps,"� he said, adding: "The people are hungry for my broadcasts. Whenever I come on, I get hundreds of phone calls afterwards." "As I've said before, I am an event." � Mr. Aligbonon's thoughts on the role of women and on adultery have a somewhat antiquated air about them. "Today, we see women place the meal of their husband in front of him without taking any particular care. This is a mistake,"� he writes in one of his books. But his homilies have a large following, he said. "People have said to me that I am an awakener of consciences,"� Mr. Aligbonon said. There is some evidence for this. Professor Iroko, the historian, agreed that the soft-spoken Mr. Aligbonon has a larger following and is more in the limelight than others in the voodoo priesthood. He is also unusual in having had more schooling than most voodoo priests in Benin, and can express himself easily in French, Mr. Iroko said, helping him move between two worlds - that of traditional practitioners and of academics. Mr. Aligbonon also belongs to the upper reaches of Beninois aristocracy, increasing his popular following. He is a direct descendant of the 13th-century princess Aligbonon, who in legend is said to have mated with a panther to found a historic clan at the origin of one of the great African kingdoms, Danhomè¨, which later became the French colony of Dahomey, as the country was called until its name was changed to Benin by the military dictatorship in 1975. The palaces of the kingdom, with superbly expressive bas-reliefs, can still be seen in Abomey, which had been the ancient kingdom's capital. "They say, 'This is great, fantastic,'"� Mr. Aligbonon said. "But, you can't eat 'fantastic.'" Copyright 2010 The New York Times Company. Reprinted from The New York Times, International, of Tuesday, September 14, 2010.